A left ventricular aneurysm causes persistent ST elevation 2 or more weeks after an acute infarction. On echocardiography there is paradoxical wall movement. It can be difficult to tell apart LV aneurysm from re-infarction. An aneurysm is less likely to have dynamic or reciprocal changes and more likely to have a T:QRS ratio < 0.36 in all chest leads. An infarction is more likely to have ongoing chest pain and haemodynamic instability. 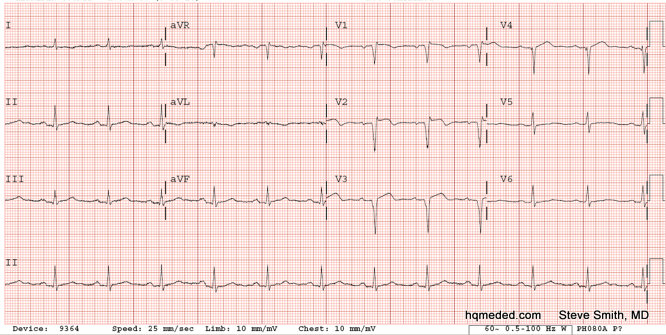 This ECG is from a man in his 70s who presented with acute chest pain on a background of a recent CABG. This ECG shows deep anterior Q waves suggesting an old infarct , with persistent ST elevation suggesting a left ventricular aneurysm.